This beautiful condominium on the north coast of Cozumel is the tallest building of the island. 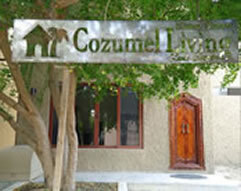 The rental offers 3 bedrooms and 4 bathrooms, completely furnished and equipped for all your needs. The Peninsula Grand also has a wonderful infinity edge swimming pool, a club house with a snack bar and game room, a fully equipped gym, a sauna, a steam room, and showers. To add to all of this, there is a beautiful 21,500 square feet of beachfront sandbox complete with palapas. This is a private beach area with plenty of comfortable lounge chairs and 24 hour security. Located on an excellent zone for snorkeling, you can see a huge variety of iridescent fish, colorful coral and large sponges. You and your family and friends will enjoy your vacation in this quiet community, where you are oceanfront, 4 minutes from the golf course and 10 min from downtown, restaurants, shops and groceries stores. This is the perfect place to vacation in paradise.